Many of us do not fully use the power of mediation to the level that we ought to, so that we enjoy all its benefits especially those that help us grow spiritually to become better beings. In case you aren’t sure of what it means to meditate, know that it’s a process of withdrawing from the external and directing your concentration to an inward centre that is your inner self. From strengthening your immune system to reducing stress and tension, meditation is a science that has many health and spiritual benefits. 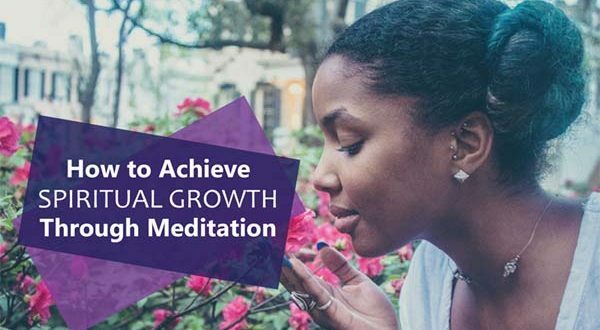 Without it, we cannot talk about spiritual growth since it’s a great technique that strengthens your ability to connect with your soul. Wondering how this science improves your spirituality? Well, the benefits are numerous but the primary purpose of this powerful act is to make your conscience clear facilitating a healthy and progressive spiritual growth. Increasing your spiritual awareness requires a careful process that helps you find out what nature has to offer because many life secrets aren’t easy that you’ll just understand without meditation. You, therefore, have to perfect the art of connecting with nature so that as you grow spiritually, you’ll be able to understand life from the correct spiritual point of view. Spiritual growth is about understanding who you are and the mission you are required to accomplish. While many people use different approaches depending on what they are after, you need to have the correct spiritual formula that will help you grow. Remember that this is a process that not only has benefits to the soul alone. In fact, many physicians nowadays recommend it to their patients for various health benefits. As a result, there is no one formula of meditating, but all you have to do is focus on the end results that you want. With the goal in your mind, you’ll no doubt get a way that will lead you that place you want. A common basic procedure that many people adopt for spiritual benefits is meditating twice a day. You can choose to do it in the morning immediately getting out of bed and finally before you retire to it in the evening. With these two times, you can rest assured of reaping the full benefits. When meditating, sit a chair that’s comfortable, hold up your head and direct your brain to those higher regions of your brain. However, do not forget to inhale and exhale until you feel centered fully. Try you best to avoid distractive thoughts and maintain a state of silence for a few minutes. For best results initially, keep your meditation sessions small, taking about 20 minutes each time you meditate will no doubt take you to that state that you want. After sometimes preferably weeks or even months, evaluate your results and find ways of boosting it, so you soar to the highest heights of spiritual growth. What you need most is the growth and nothing else. If you are not getting what you want, you need to revise your procedure and find out what you need to add to the process, so you gain. Indeed, meditation is a very vital for our daily spiritual activities and relationships. If we use it well and be consistent, we can be sure of healthy spiritual growth.